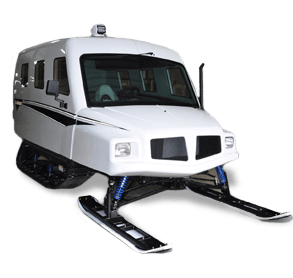 For ice fishing, search and rescue, hauling or tourism, the SnoBear line of reliable, heated track vehicles are an extraordinary and popular addition to Midnight Sun’s line-up. Living and working in the North necessitates winter travel in remote areas under extreme conditions. 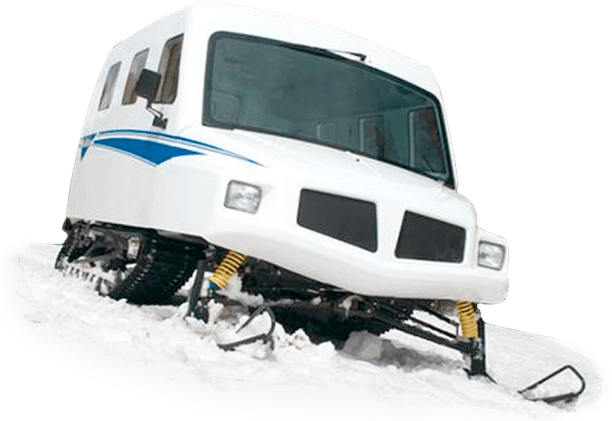 SnoBear offers two types of tracked vehicles that increase safety, comfort, productivity and quality of life. As an exclusive dealership, we also offer expert local service of these vehicles. 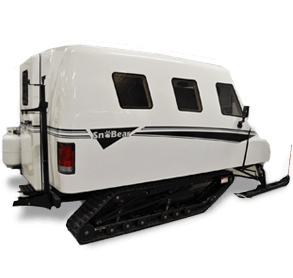 The SnoBear is a heated recreation vehicle which that is the ice-fisherman’s or Northern tourism operator’s dream machine. It has an exclusive hydraulic lift system which can raise and lower the machine 12”, providing the advantage of a static ice-fishing house but the comfort, mobility and adventure of a heated snow vehicle. It is also a very enjoyable way to entice a family to the cabin! New this year! Fully eqiupped with all options and a custom upholstered interior, the SnoBear XP merges style with utility. Has all the options you need at an affordable price. Our base model. Perfect for those who enjoy customizing their own machines. The Grizz industrial model is fast, smooth and fuel-efficient with a low environmental impact. It handles up to 10 passengers and can haul heavy loads, such as fuel barrels, with front and rear tow hooks directly on the mainframe. 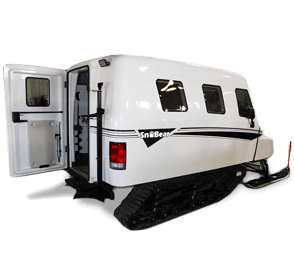 This fully sealed, heated snow vehicle with power steering provides superior traction and is used in search and rescue, ambulance, maintenance and camp applications all over the circumpolar regions of the world. Northern mining and exploration companies appreciate its utility and its value in maintaining the safety of personnel at remote barrenland sites. Whether it’s for ice fishing, search and rescue, hauling or tourism, the Snobear is the perfect vehicle for northern work or play. We can answer any questions you have to find the right fit for your needs.